This time we’re talking with the Head of Business development Tadas Četkauskas who is going to tell us more about Stovendo which has recently raised 1.5 M EUR funding. So what is ‘’Stovendo’’? How does it work? In general, it is a technology that is dedicated to digitalize and to transform legacy retail processes into omnichannel sales strategy and model. 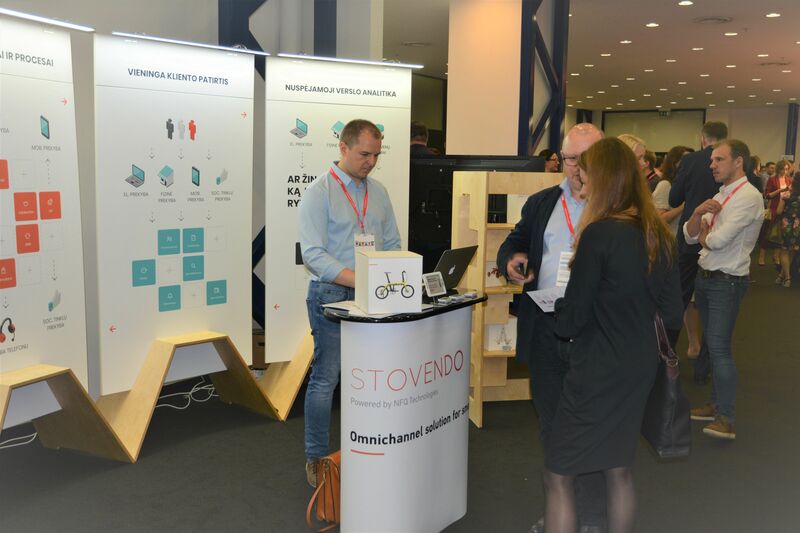 First of all, STOVENDO technology focuses on in-store process digitalization and seamless experience for the customer as well as how to detect and convert unexploited opportunities during in-store visits into sales. In this sense, STOVENDO technology is exclusively oriented to improve in-store processes during assisted sales, engage with the customer and to empower store associates to perform and to serve customers on the next level. Secondly, STOVENDO focuses on the integration of different types of sales channels (e-commerce, m-commerce, in-store, etc.) into a central management system when distributing sales operational data (products, clients, orders, etc.) within all channels. Product information management, online sales channels management, offline sales channels management, pricing and fulfillment, customer experience and other sales operations processes are being provided within a powerful platform STOVENDO. In this sense, the technology appears as the operational platform for retail businesses that executes the omnichannel strategy. Finally, STOVENDO goal is to provide business analytics and predictivity over the connected sales channels on a real-time basis. STOVENDO connects, captures, collects and analyses data gathered from IoT sensors and sales associates in-store as well as customer interactions online and offline, and delivers sophisticated data layer based on the scientific data modeling approach. Retailers that use STOVENDO analysis module can dive deep into business excellence reports and improve the performance of particular business KPI’s over the selected online and offline channels. What are your competitors and competitive advantages? STOVENDO is highly scalable and customizable platform which can be used as a one-stop management solution to run the omnichannel retail concept or just by selection of desirable functions to operate and improve very specific business areas. For example, retailers that have a need to improve only in-store assisted sales may integrate or use the version that is dedicated to offline channels customer shopping experience improvement. Those who run sales on all different types of sales channels can use STOVENDO as the omnichannel solution by full or partly modular approach. However, the technology itself is not enough to make your business thrive. That’s why STOVENDO is not just another stand-alone product. At NFQ, we call it a hybrid ecosystem. Together with technology solutions to manage omnichannel processes and to run predictive retail, NFQ shares the experience of entrepreneurs, retail practitioners, data scientists, and simply brilliant minds. We enable you to access our laboratory for experimental development and to transform your retail business on a data-driven foundation. What were the reasons behind coming up with this idea and launching this product? First of all, NFQ as a service provider with 15+ years of experience in online commerce market has brought together and accumulated tremendous know-how on how to become successful online. Secondly, e-commerce transactions in 2017-2018 are estimated at 2.5–3 trillion US dollars. Despite the enormous amount of money, it is only about a tenth of the total world trade volume. That is precisely the reason why the worlds’ leading e-commerce players such as Amazon, eBay, and even Google are investing in bricks and mortar. However, the trend digital retail leaders launching brick and mortar stores does not mean that the concept of trade and the supermarket itself remains associated with its classic nature, i.e., being a simple place for product distribution and sale. The development of digital technology dramatically changes the concept of physical trade, making it into a place of delivery of product experience rather than merely a product distribution point. With the use of technology, the boundaries between e-commerce and physical trade are fading. It is evident that e-commerce is stepping into the field of physical trade, while shopping malls are increasingly exploiting technology. This is a key factor why the retail industry needs entirely different technology solutions to operate the business in comparison to situation decades ago. The main task for sellers and trademark owners now is to sell an experience utilizing the principles of omnichannel trade. For these reasons, traders will have to re-examine the measurement tools and metrics that have been used to assess the effectiveness of the trade model. Some of the metrics that analyze the efficiency of the shopping center – sales volume and value per square meter, sales volume and value of customers served and consultations provided, amount and value of recurring sales, return on investment – are becoming inaccurate and mostly worthless when it comes to omnichannel retail and customer experience measurement. Online data collection and analysis principles will have to be transferred to supermarkets and, ultimately, to include the entire omnichannel trade chain. Otherwise, the earnings per square meter will give the merchant a zero value because he doesn’t know how his business is faring. And here comes STOVENDO idea and solution strategy to help to manage and operate future retail that combines all sales channels into the one seamless shopping experience. When exactly did you launch, what were the main challenges before launching? In fact, STOVENDO does not have a specific date of birth. It is a combination of 15+ years of experience of technologies and retail industry know-how that was build and accumulated at NFQ, and now is being converted into the STOVENDO ecosystem. By the way, it also has no exact date of product completion. Most of the challenges are related to dynamic changes in the global retail industry and how to get the most value out of it. You can’t just switch off the knowledge locator or step back from the industry watching, even for a while, if you want to deliver the value. We target small and medium retailers who want to transform the shopping experience for their clients in-store and those who want to turn out from the old and sluggish retail philosophy when merging the different sales channels and dive into the blue ocean of omnichannel. Location vise and on a short-term basis we target Baltics, Germany and the US due to long-term relations, knowledge base and tie up with these markets. The long-term vision is oriented to scale NFQ and STOVENDO related services globally. What are the main challenges while working on this product and how are you overcoming them? retail professionals and their shopping malls and all related infrastructure were research and development of the product can be performed and evaluated. data scientists and applied mathematicians (partnership with Kaunas Technology University), who are responsible for the execution of the data and predictivity layer research and development. business and market research scientists and entrepreneurs from the University of California in Los Angeles as well as business digitalization and customer experience professionals from Disney, Johnson&Johnson, Google. How are you funded? Do you seek extra funding? In general, product development is being funded by NFQ and some of the commercial partners. Investments related to STOVENDO data analysis and predictivity layer development that is being developed with partners from KTU are partly funded by the Lithuanian Business Support Agency of The Ministry of Economics. In general, we do not seek additional funding very actively, but in case new opportunities arrive – we might be open for consideration. Please introduce your founders, your core team and your broader team? How has business been so far? Could you share some numbers to illustrate this (users, sales, etc)? The business value numbers we got from the first installations of the system is just amazing. For example, with the use of STOVENDO technology, services related to in-store processes and assisted sales reached a positive impact from 10% to 30+% when measuring customer satisfaction and increased store sales for some of our clients. General KPI’s, such as recurring purchases or order sizes are also showing very positive results with STOVENDO’s implementation. Despite the initial metrics, it important to note that, with the current turbulence of the retail industry in mind, this is not a question about having some positive or negative numbers. Currently, the question for retailers is survival in the competitive retail market. And it all boils down to customer expectations and being able to respond to them. Retailers can not afford to ignore customer expectations anymore. Future plans, ambitions? Simply speaking – what’s next? Research, develop and scale. Globally.